Fall In Love with The Falls @ Hayden Run! 2 Beds 2 / 1 Baths 1 Partial Bath 1,675 Sq. ft. Description: Open sunday, august 5, 1-3! 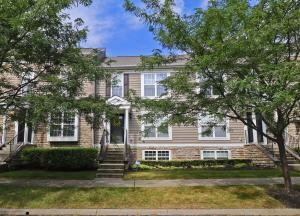 Beautiful, upgraded, spacious condo in the falls at hayden run. 2 large bedrooms, 2.5 baths, large finished basement and 2 car garage. Upgrades include crown molding, granite counters in kitchen and baths, glass backsplash, dark wood floors in kitchen, stainless steel appliances, kitchen island, under mount sinks with high end faucets and paver patio yard with fencing. Bedrooms each have their own full bath and large closet. Owners suite has upgraded double under mount sinks with granite counters & walk-in closet. Large finished basement with half bath, extra storage & custom built-in entertainment shelving. Great amenities including the goat bar/restaurant, 2 pools, sand volleyball court, 2 fitness clubs, playground & club house.